The Meg is based on the 1997 novel Meg: A Novel of Deep Terror written by Steve Alten. The novel and now film center around Navy deep-sea diver Jonas Taylor (Jason Statham) who is called in to help rescue some of his previous colleagues on an exploratory expedition gone wrong. In order to complete his mission, Jonas must now face the one thing that turned him away from his career all of these years, a giant 70ft shark called the Megalodon. The Megalodon was believed to be extinct but now the massive marine predator has resurfaced and now Jonas and his crew are tasked with preventing the giant creature from reeking more havoc. I have to admit I had mixed feelings about this movie when it was first announced. While I enjoy most of Jason Statham’s films, I wondered if Hollywood really needed another shark movie. As the opening sequence began I immediately became excited. The movie wasted no time getting into the plot until I realized that The Meg not only has one but three different plots in the film. What the movie gets right is realizing that it is only meant to be an exciting shark movie delivering cheesy dialogue and jump scares. While Jason Statham commands attention while on screen, it is unfortunately not enough to leave the audience wanting more. Where the movie loses its steam was the decision to focus on some of the side characters. While I am always a fan of proper character development, there is always a time and place for it and this movie was not it. One of the characters who gave me the biggest headache was Page Kennedy’s character DJ. While there is no easy way to says this his character was your typical token black guy but on steroids. Why some of his jokes landed others seemed highly forced making me wondering if they really thought this dialogue was needed. The movie also tries to provide unnecessary sexual tension and some untimely family drama making the audience wonder if director Jon Turteltaub knew he was making a horror shark film. While The Meg provides brief moments of excitement and horror, the movie overall loses steam due to unnecessary character development and lack of horror. 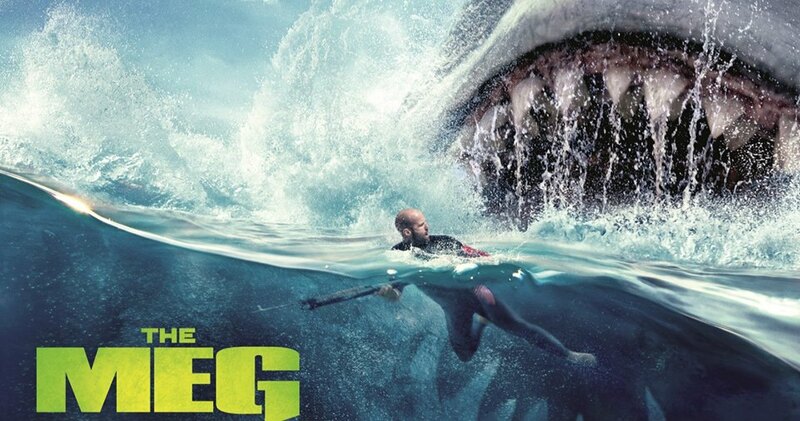 The Meg ultimately falls short of becoming the next great shark film leaving fans wondering when will there be a worthy successor predecessor to Jaws. Overall, I would recommend you WAIT to see this film in theaters. The Meg swims into theaters this Friday, August 10th. Want to make your own decision on if you should pay or wait? Click here to purchase your tickets at Fandango, so you don’t get sold out. Have you seen The Meg? Share your thoughts on the film in the comment section below! I thought the film was funny and entertaining for a rainy day at home. I enjoyed it very much and I agree about the DJ character but it was %100 better than I thought it would be! The whole time I was watching this movie. I wanted to get back to the sharks! Thanks for the review. I will head your warning and WAIT this one out. It was about as good as I was expecting it to be, which was more or less on the same level as “Sharknado”.